This blog is my little way of sharing some of the happy things in my life along with very random and sometimes silly things, my finds and favorites, stories, my daydreams and realities. My official bio is Founder and Designer of KOKOON, a women’s contemporary clothing company. I’m also a neurotically obsessed daydreamer. A Midwestern girl. My size 6 foot often ends up in my big mouth. I cry during commercials. I’m a shoe freak, a college dropout, a Korean adoptee, and I’m messy. I worry about everything. I believe manners matter; every evening should involve wine; all recipes should be limited to 5 ingredients; cynical people are boring; and everyone looks cuter in a dress. 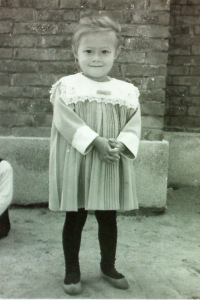 I came to America in 1968 as an almost 4 year old. My adoptive parents gave up an infant girl to take me instead. No, I don’t remember it. I don’t remember much in general, actually. I spent my younger years in what was called a suburb, but really was mostly farmland at the time. I left home at 14 and spent the rest of my teenage years in a variety of shelters and girl’s homes, eventually landing at my foster parent’s. Don't feel sorry for me...I have always felt incredibly lucky and besides, I turned out awesome! When I grew up I met my husband in a bar. He’s the BEST. I call him Dik-San, which started as an Asian shiksa joke but it stuck and I like it. He told his parents I was the closest thing to a JAP he was going to marry. That was right after he knocked me up. We have 2 outrageously talented kids, Sam and Tess. They’re both adults now and Dik-San and I are continually amazed at what brilliant people we made. People ask me a lot about my company. One of the things they want to know is who designs it. Sometimes they ask me this right after I tell them I’m the designer. I love all aspects of design and visual candy, decorating, cooking, and I'm fascinated by the business of fashion. This blog is my little corner of the world where I share my happy, my random, my finds and favorites, stories, my daydreams and realities. Anyway, I'm rambling now. I’m glad you're here. Maybe you’re a daydreamer too. I sure hope so, it’s great.